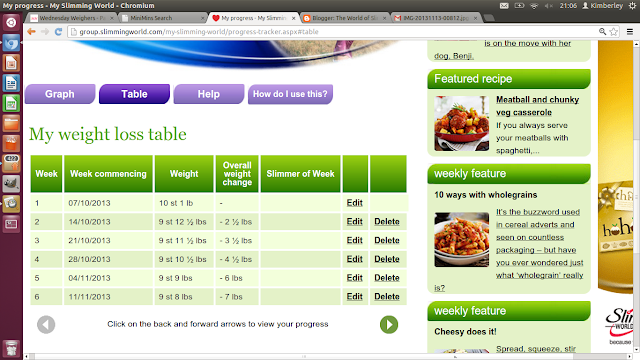 The World of Slimming (trying to slim with Slimming World): 5 weeks. 7lbs. Half a stone. DONE! 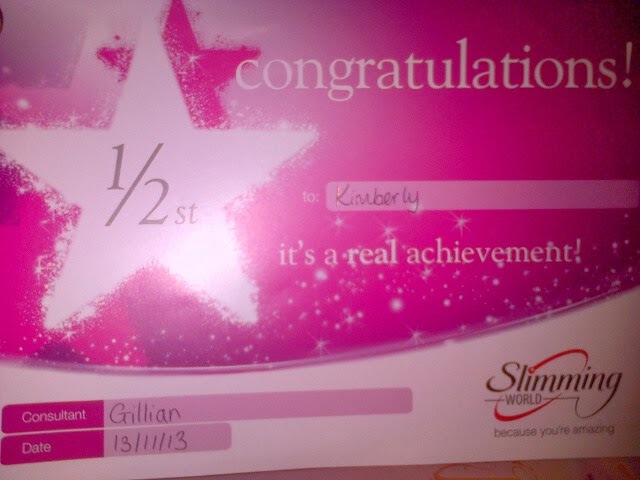 Today I lost my 7th pound using the principles of Slimming World. My overall buzz was killed as I wanted to lose 2lbs this week but (only) lost 1lb. I did however receive a certificate which will be stuck on my mirror shortly. As well as a sticker that was promptly slapped onto the back of my Slimming World book. Oh- and an announcement and round of applause at group. But how do I feel- 7lbs lighter? Well- truth be told I'm sort of noticing how much weight I need to lose and at the moment that doesn't necessarily feel like a good thing. Noticing, that is. I mean, obviously I need to lose weight or I wouldn't be doing this in the first place. 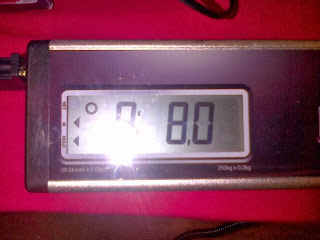 But I'm a bit cross that I let myself go as far as I did and that half a stone lighter I am still very overweight. It's a bit disappointing. On a more positive note- I did notice and I am doing something about it. My jeans (I have to wear the same pair to group each week in case it affects my weight) are a little baggier and my triple chin is definitely turning into a double. This is good. Oh, ignore me- I'm just annoyed because I didn't lose 2lbs and I've really tried this week! I went to an exercise class for Pete's sake!!! I only went out once at the weekend, I'm within my weekly syns (for the first week since I started! ), I ate superspeed soup for THREE days!!! I hate it when the "Slimmer of the Week" says how surprised she is as she had a massive blowout at the weekend- takeaway, beer the lot and there's me all saintly and not losing my god-damn 2 pounds!!! If I stay on the same path I shall be 9st 2lb by Christmas and more importantly *hopefully* a size 10 by my 25th Birthday!! !